There are 12 Assisted Living Facilities in the Aurora area, with 3 in Aurora and 9 nearby. The average cost of assisted living in Aurora is $4,400 per month. This is higher than the national median of $3,346. Cheaper nearby regions include Hudson with an average starting cost of $3,375. To help you with your search, browse the 57 reviews below for assisted living facilities in Aurora. On average, consumers rate assisted living in Aurora 4.4 out of 5 stars. Better rated regions include Hudson with an average rating of 4.6 out of 5 stars. Caring.com has helped thousands of families find high-quality senior care. To speak with one of our Family Advisors about assisted living options and costs in Aurora, call (855) 863-8283. Aurora, Ohio, is 30 miles from Cleveland and Lake Erie. With a population of about 15,700, it offers seniors a small-town feeling while being relatively close to a metropolitan area. Aurora has three assisted living facilities, and 15 more are close by in areas such as Twinsburg and Hudson. 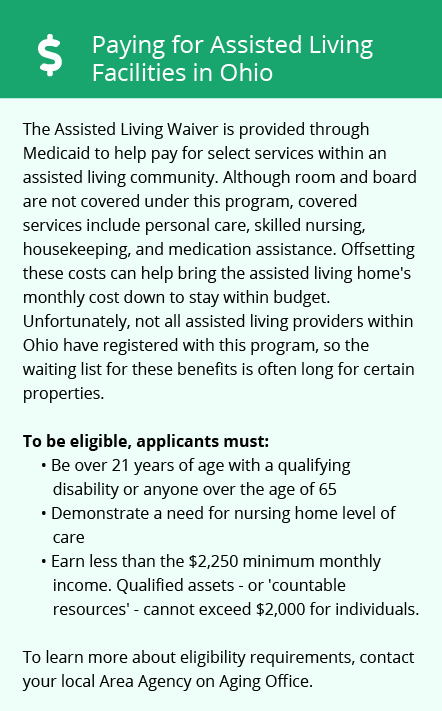 Ohio calls these communities residential care facilities, and the Ohio Department of Health licenses them. They help residents with activities of daily living such as dressing and grooming, and they provide supervision. The cost of living in Aurora is somewhat high. On Sperling’s BestPlaces, 100 represents the average U.S. score. Aurora scores 111.3 overall, with 134 for housing, 106.8 for groceries and 107 for transportation. This may affect seniors on a budget. Aurora gets above-average amounts of snow and below-average amounts of sunny days. In fact, it gets only 164 sunny days a year and 69 inches of snow. Seniors may not like that. The violent-crime rate here is relatively low, so seniors can breathe easily while attending appointments around town. While the U.S. average for violent crimes is 31.1, it is 18.9 in Aurora. Senior transportation options here can be limited. The Aurora Transportation Program is not available to residents in assisted living, but seniors can take Uber or a cab to Solon, seven miles away, and from there, take public transportation into Cleveland. Aurora can be somewhat walkable, with a walk score of 65. Aurora is home to the Barrington Golf Club, a Jack Nicklaus signature course. It is also home to Tinkers Creek State Nature Preserve and near Liberty Park. The Aurora Farms Premium Outlets can also make for fun shopping, and the community theater puts on plays for seniors on day trips with family. Nearby Cleveland offers the tremendous wealth of arts and cultural opportunities that only a big city can. Cleveland is a member of the AARP Network of Age-Friendly Communities, meaning that its elected leadership “has made the commitment to actively work toward making their town, city or county a great place for people of all ages,” according to AARP. Assisted Living costs in Aurora start around $4,400 per month on average, while the nationwide average cost of assisted living is $4,000 per month, according to the latest figures from Genworth’s Cost of Care Survey. If you’re a Medicaid waiver participant in Aurora, you probably will have a cap on your room and board expenses that approximately equals the SSI federal benefit level. The two waiver programs are MyCare and the 1915(c) Assisted Living Program. 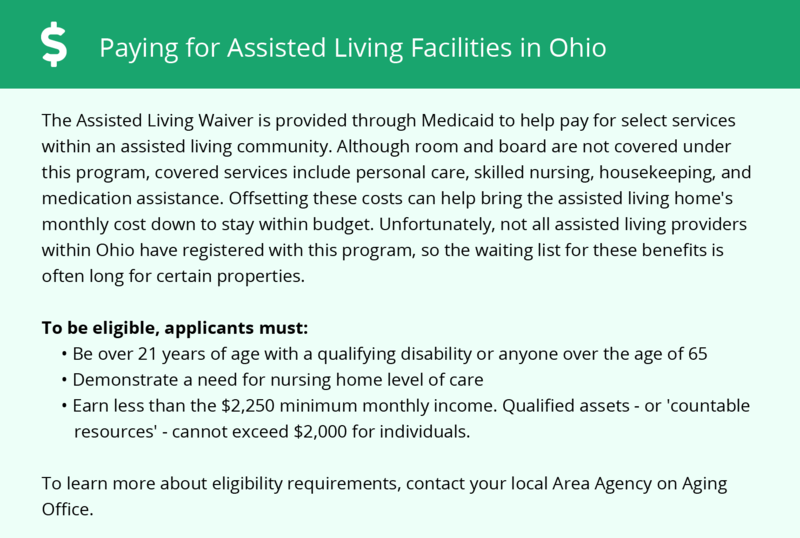 Ohio also offers a state supplement program that can be used toward paying assisted living expenses. To see a list of free assisted living resources in Aurora, please visit our Assisted Living in Ohio page. Aurora-area assisted living communities must adhere to the comprehensive set of state laws and regulations that all assisted living communities in Ohio are required to follow. Visit our Assisted Living in Ohio page for more information about these laws.